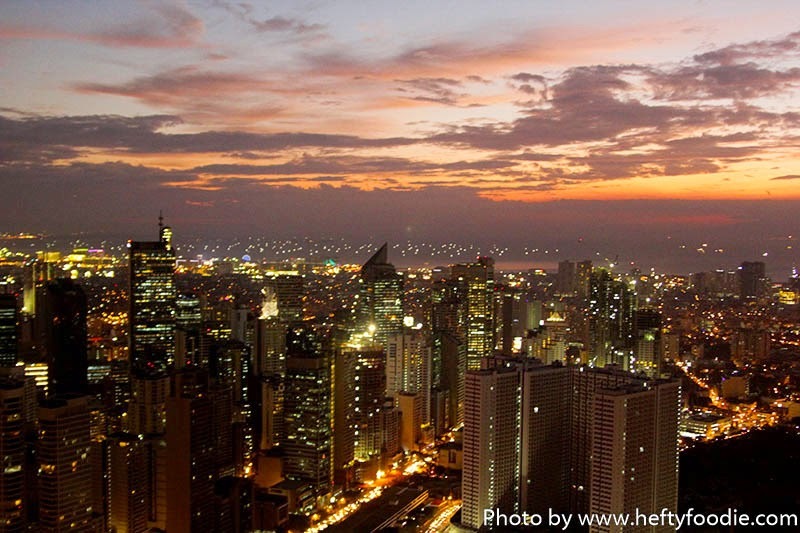 It's easy to see what the whole spectacle of 71 Gramercy is about, especially considering it is perched on the tallest building in the Philippines, giving you a spectacular view of Makati city. . 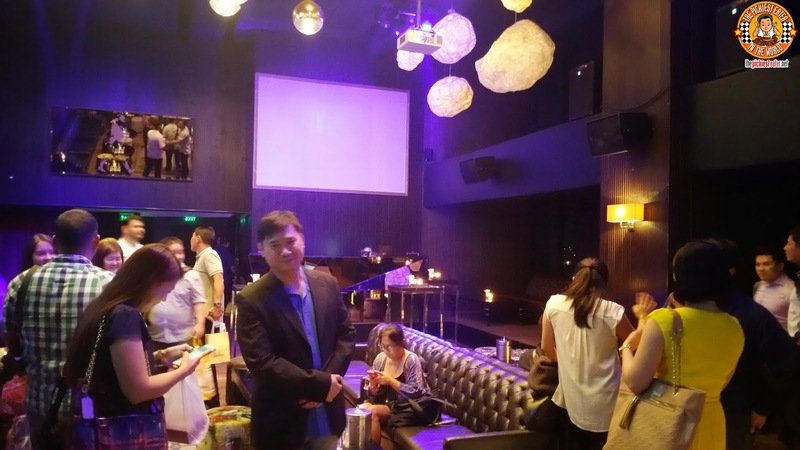 But within its walls is a elegant lounge that has quickly become the in place to be, setting a whole new standard for Makati's nightlife. The purpose of the dinner was to introduce us to the a fantastic team up that would put The Avengers to shame. 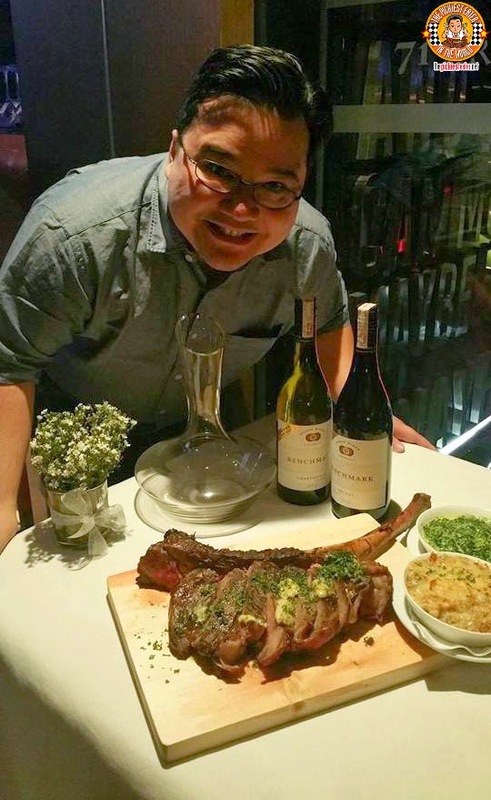 With Chef Cecille manning operations and Chef Carlo Miguel in charge of the kitchen, Gramercy has formed quite the dynamic duo.. and it shows in its food! It was almost as if Chef Carlo Miguel had Rina in mind when he conceptualized his starters, but unfortunately my beloved missed this. Our evening began with the Cured Salmon. 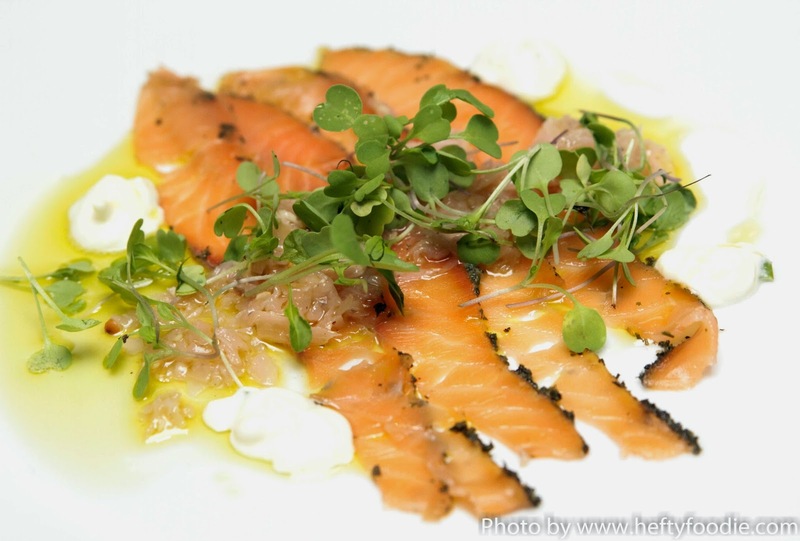 Thin slices of smoked salmon, cured in green tea, and topped with arugula, feta cheese, ginger and shallots. 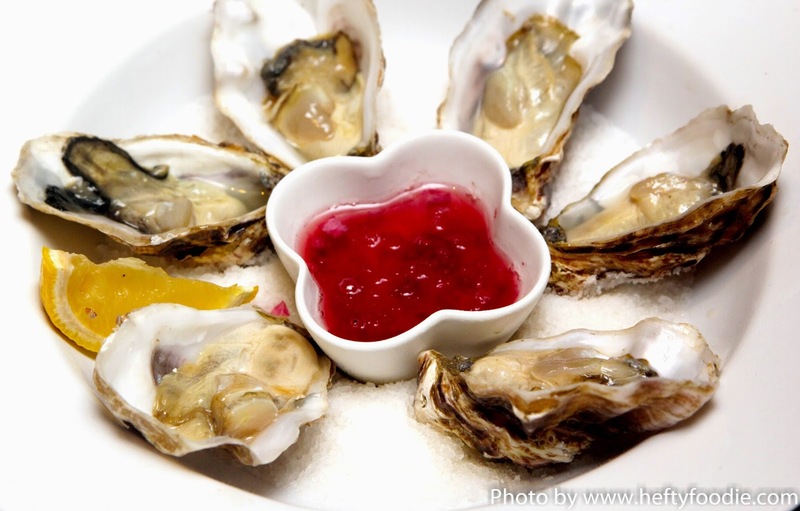 I'm not too big on the raw fish but even I had to admit this was pretty darn good. Next up was the Prawn Salad. 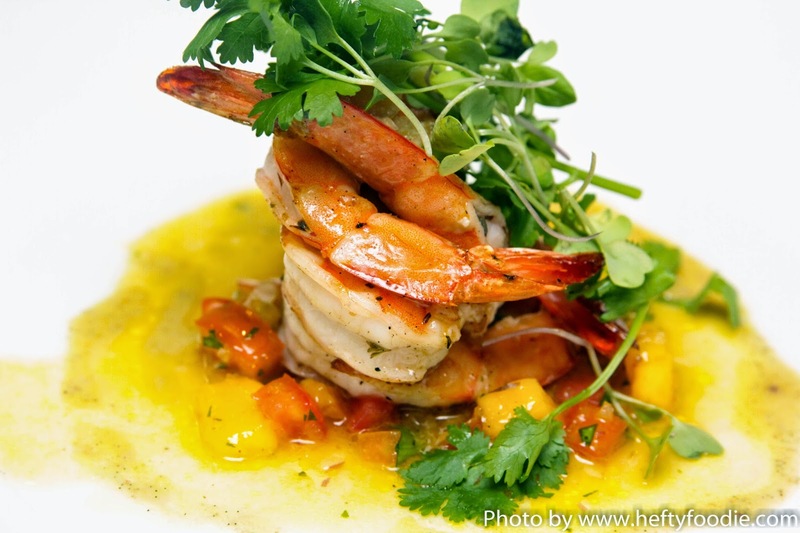 Plump, grilled prawns perched on a bed of Guimaras Mango Salad, and drizzled with a Vanilla dressing. Shrimps with mango and Vanilla doesn't really sound like it would work, but Chef Carlo seemed to pull this off. The Tagliatelle Truffle was one of the hits of the evening. 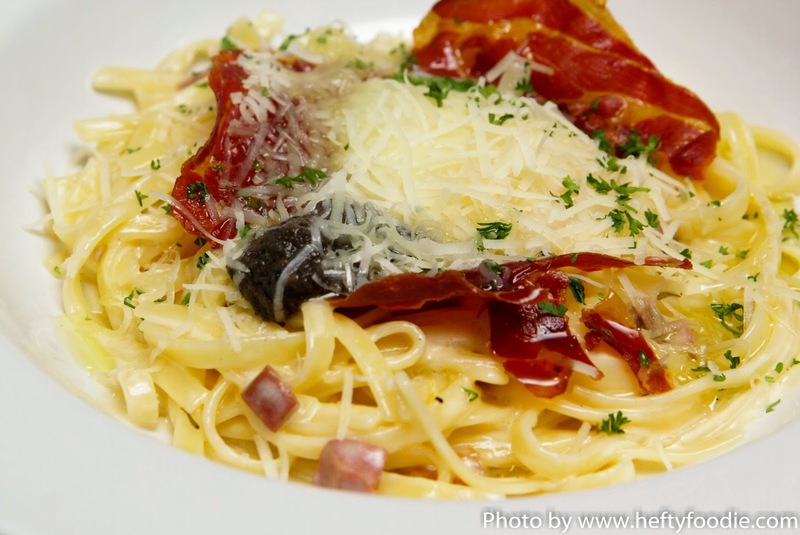 A plate of beautiful Al Dente Tagliatelle noodles bathed in a luscious truffle cream, and crowned with an amazing strip of crisp Prosciutto, and a perfectly cooked 62˚C egg, and topped with a generous heaping of Parmesan cheese. Everything about this dish was amazing. From how the creaminess of the sauce played off the saltiness of the Prosciutto, that is tempered by the richness of the egg, and then balanced by the Parmesan cheese. Every component was well thought out and complimented the other perfectly. One of the best pasta dishes I've ever had in the metro. I believe my love for all things burgers is stuff of legend. Which is why I was really excited to try the Gramercy Burger. Weighing in at 200 grams, the burger patty is a mouthwatering blend of US Angus Beef Chuck, Ribeye, and Short Rib. The grilled patty is tucked between Gramercy's homemade brioche bun, and wrapped in a blanket of gruyere cheese, then topped with sauteed onions. 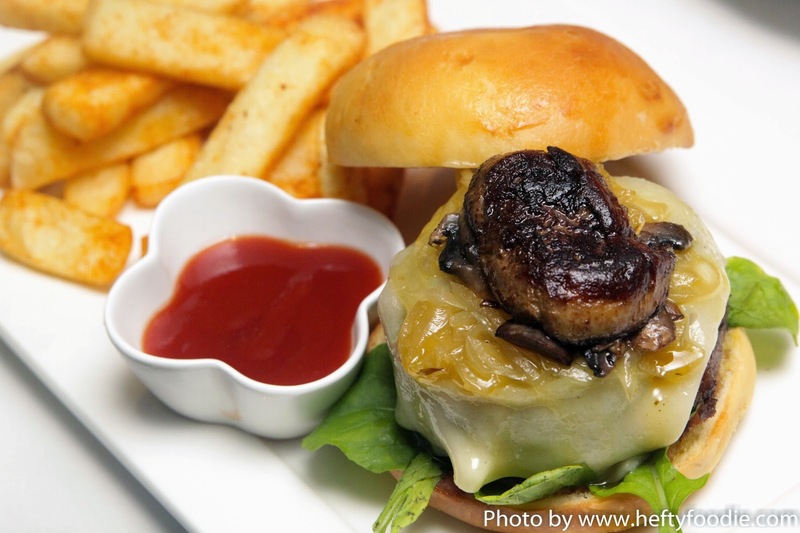 The proverbial cherry on top of the Gramercy Burger, is a piece of stunningly cooked Foie Gras, that adds a richness to the burger. As you can imagine, this was all sorts of awesome. Even without the Foie Gras, the burger can stand alone. 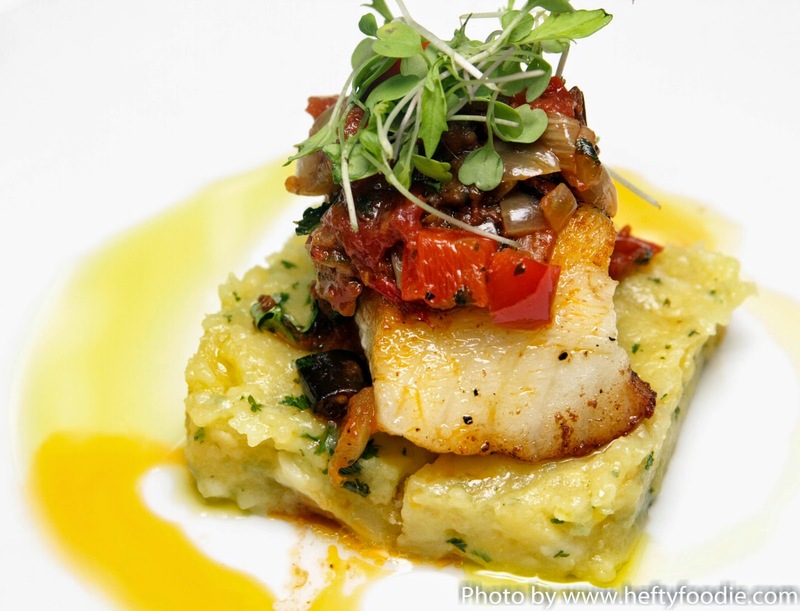 Sea Bass is one of my favorite seafood, and Chef Carlo's Chilean Sea Bass was a reaffirmation of that notion. A beautifully seasoned Sea Bass fillet is pan roasted to a gorgeous cook, and topped with a flavorful eggplant relish. The Sea Bass then rests on a delicious bed of lemon oil crushed potatoes, making it the perfect partner for the fish (Although Rina would have probably asked for rice hehe). 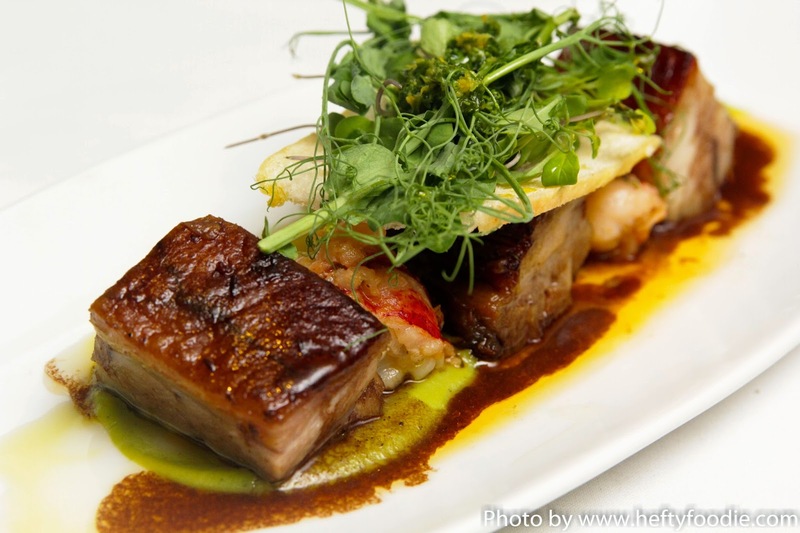 Chef Carlo Miguel offers his version of a Surf & Turf dish with the Pork and Lobster. A slow roasted slab of Berkshire Pork Belly laying in a pool of Green Pea Puree, and chunks of fresh lobster meat, Words cannot express how amazing the cook on the Pork Belly was. the meat was flavorful and the fat simply melted in your mouth. I honestly didn't notice there was lobster because I was so focused on the pork. If the appetizers were tailor made for my darling Rina, Chef Carlo Miguel's dish called Breakfast For Dinner had "Richie" written all over it. 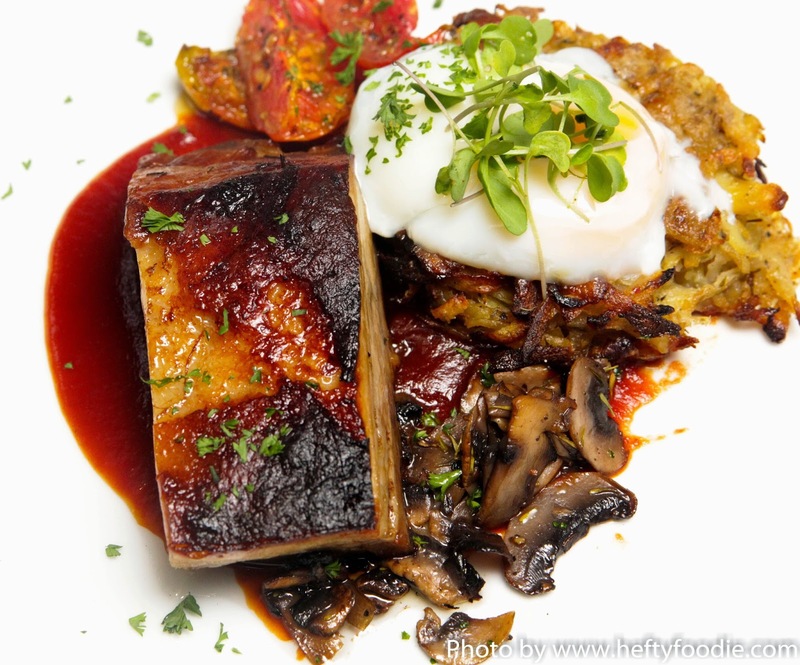 A Berkshire Pork Belly is home cured and smoked to Nirvana, then served with a 62˚C egg, sauteed mushrooms and an amazing potato hash, an further punctuated with a tomato fondant. Delicious play on flavors, especially for people like me who adore breakfast food. The Big Kahuna of the evening was the gargantuan US Angus Choice Grade Tomahawk Steak. 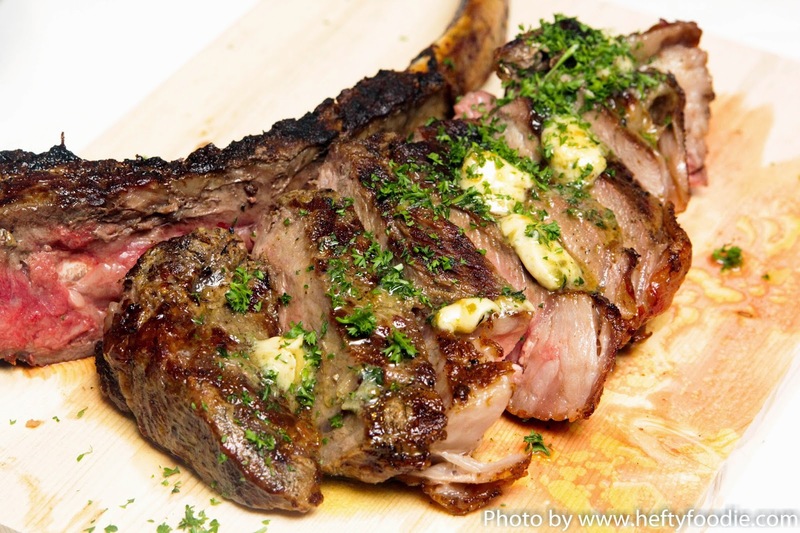 I love me some steak, especially with fat, so this fit the bill to a tee.How did it taste? Amazing. Cooking a steak this massive can't be easy, yet this was done to a beautiful medium rare, and the natural flavor was nothing short of spectacular. Not to mention, seeing how Chef Carlo added slabs of butter on to the seared meat made me think that this could be the start of a beautiful friendship. Just when we thought we were done for the evening, Chef Carlo Miguel tells us that he's about to release a slew of desserts for us to try. Being the nice guy that I am, I gladly obliged. And I'm so glad I did. 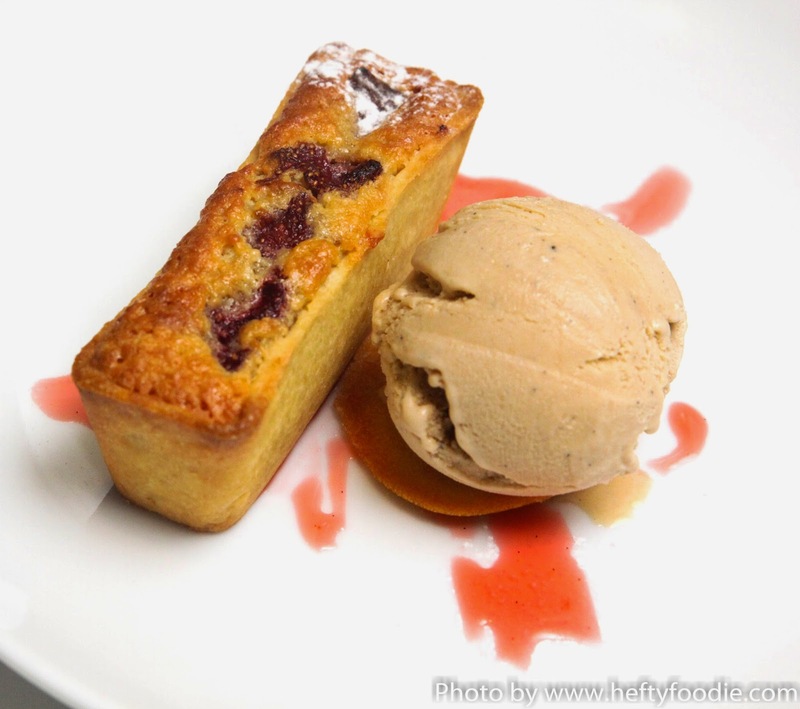 The Almond Tart is a dessert that most definitely must not be missed. The tart was absolutely delicious, The smooth almond flavor in the tart has a mix of delicious strawberries for an innate sweetness, and the rhubarb giving of a nice tartness to the dish, and the ice cream serving as the tempering factor that balances the flavors together..
Picture a rich, chocolate souffle, topped with a delicious salty peanut ice cream, and a caramelized banana swimming in a sweet butterscotch sauce.. That is Chef Carlo's Chocolate and Banana Souffle. And yes, it tastes as amazing as it sounds. Next up was the #Legit Chocolate Cake. This is one chocolate cake whose legitimacy cannot be denied, it needs its own hashtag to reaffirm it. 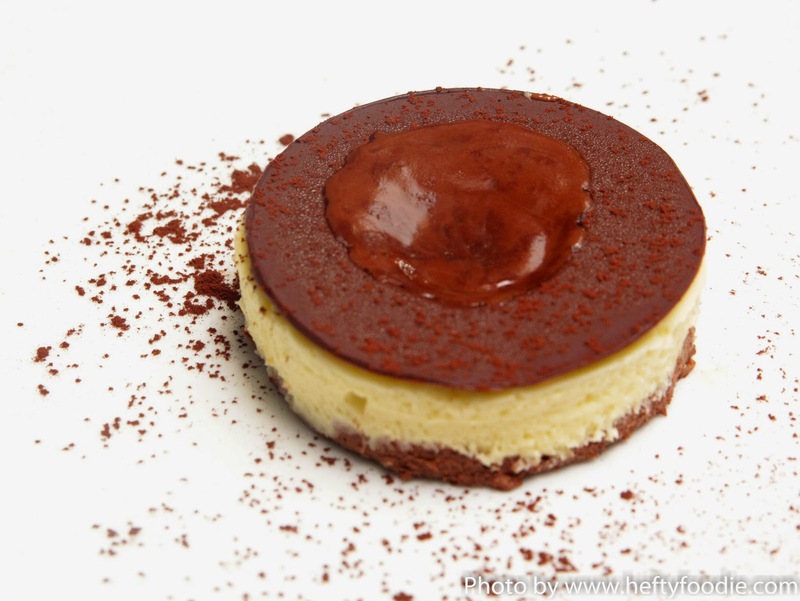 Three different types of chocolates are used to make this gift from the heavens, with a melted chocolate ganache is poured over it, giving your bite an amazing five different textures on to your palate. Finally, Chef Carlo ended the meal by taking us a little closer to home with his dessert aptly named, My Mom's Apple Pie. Taking inspiration from his mother's recipe, Chef Carlo bakes up a an apple pie so deliciously comforting, you'll feel like you've suddenly changed your last name to "Miguel". 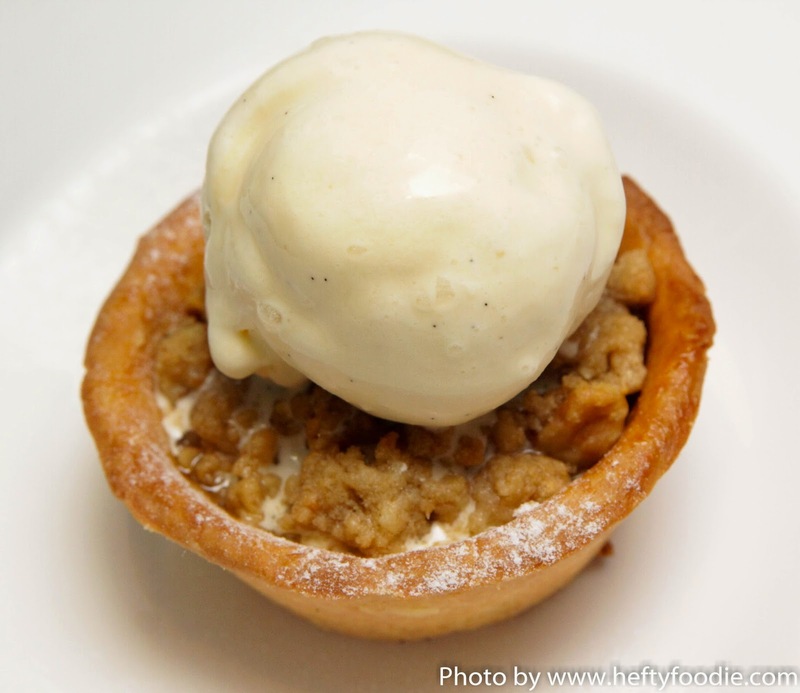 The tartness of the apples blends beautifully with the creaminess of the Vanilla Bean Ice cream, with the buttery crust giving a nice texture to the dish. Simply amazing. Individually, they are already amazing, But working hand in hand, Chef Cecile and Chef Carlo are taking 71 Gramercy to new heights! This isn't just a place to knock back a few drinks at night.. 71 Gramercy is a restaurant that should be in Everyone's "Places to Eat" list! 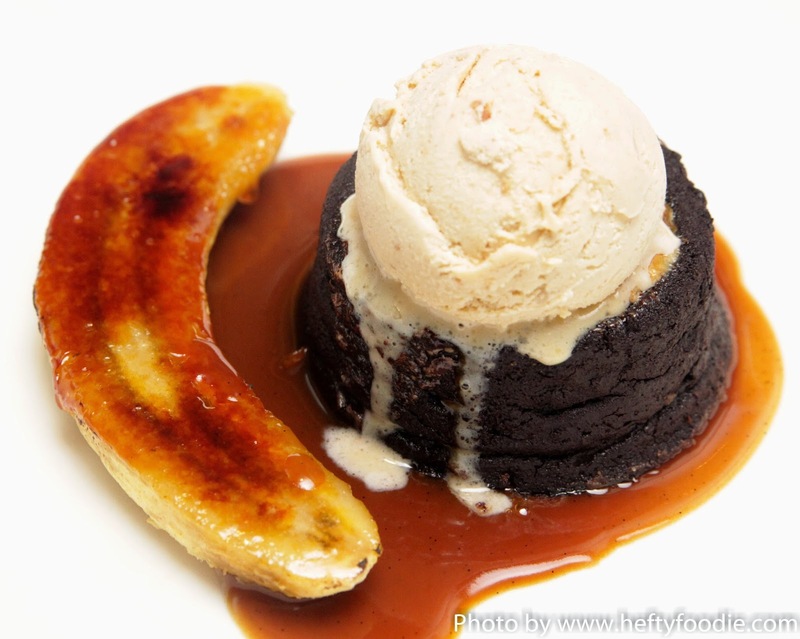 Once again, a special shout out to my friend Hefty Foodie for the Photos! Please like his social media accounts.. definitely worth the follow! 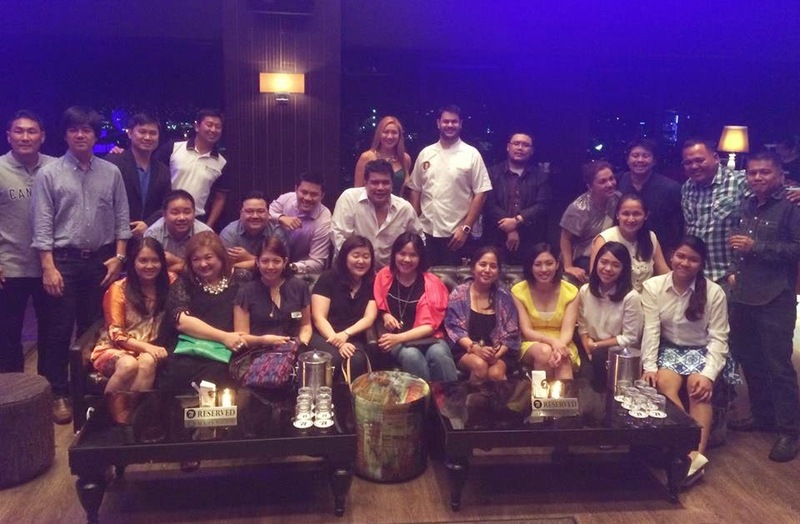 Follow 71 Gramercy on Facebook!